Home / News & Events / News / 2018 / What Does Ted Do? The topic of the Undergraduate Education newsletter for this month is something that many of you have been wondering for several years: What does Ted actually do? As part of the divisional office, you may have heard me say that, as Assistant Dean of Planning and Resource Management, I focus on funding, positions, space, and organizational issues for the division. Blah, blah, blah. Here is what I really do. I make cool charts. It’s true. I spend a good chunk of time extracting transactional data from the financial and payroll systems and shaping that data into charts and tables that are useful to the leaders and managers of the divisions. It’s really fun. All data has a story that is itching to be told. I help the data to tell its story. Take a look at the UE Sources of Funds chart. 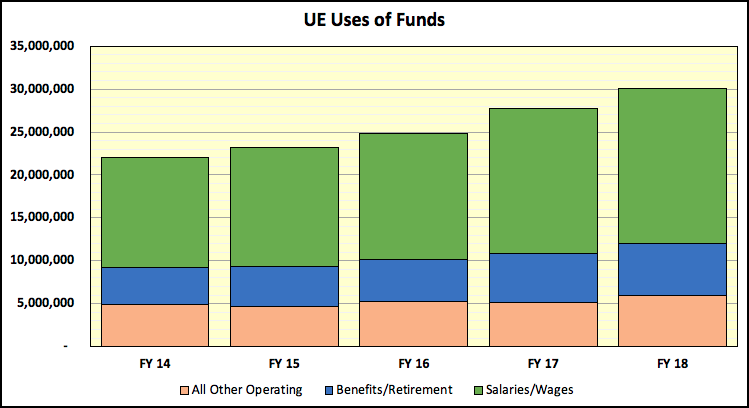 This chart shows the primary sources of funding for UE operations from fiscal year 2013-14 (FY14) through fiscal year 2017-18 (FY18). At a glance one can see that the primary sources of funds for the division includes General Funds, Tuition and Fees, Contracts and Grants, and Endowments and Gifts. By comparing the size of the stacked columns one can quickly ascertain that the General Funds comprise 54.2% of the total funds. Tuition and Fees make up 23.6%, Contracts and Grants are 18.2%, and remaining 4.0% are Endowments and Gifts. Given that this chart reflects funding sources for the actual expenditures for the division, it is noticeable that, over the past five years, there has been an overall growth in spending of over $8.0 million, or 36.4%. The funding sources that achieved the highest growth have been the Contracts and Grants, with a 68.0% increase, and Tuition and Fees, which grew by 66.4%. 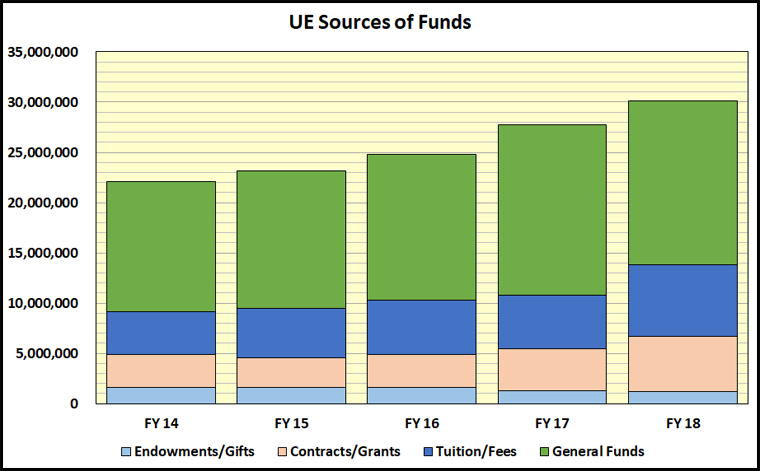 To get a sense of what those funds were spent on, please look at the UE Uses of Funds chart. It may come as no surprise that 80% of the spending was on employee payroll (Salaries and Benefits). The remaining 20% was on non-payroll expenditures (travel, supplies, services, computers, etc.). Looking at the growth, from FY14 to FY18, the total payroll increased by 40.5%, or over $6.9 million. The non-payroll expenditures increased by over $1.1 million, or 21.7%. It is clear that the primary investment over the past five years has been in positions. Digging a little deeper into the positions, I count what is known as filled full-time equivalent (FTE) positions. At UC Santa Cruz, one position is equivalent to 2,088 hours per year. The dataset I use counts the average monthly number of filled FTE positions, which I then use to calculate the average number of filled positions per year. To get a sense of how the filled positions look across the division, take a look at the UE Average Filled Positions by Appointment Type chart. As reflected in the chart, over 53% of the filled positions are Career Staff, close to 28% are student employees, and academic positions are approximately 10%. The remaining 9% are other staff positions (limited, contract, etc.). 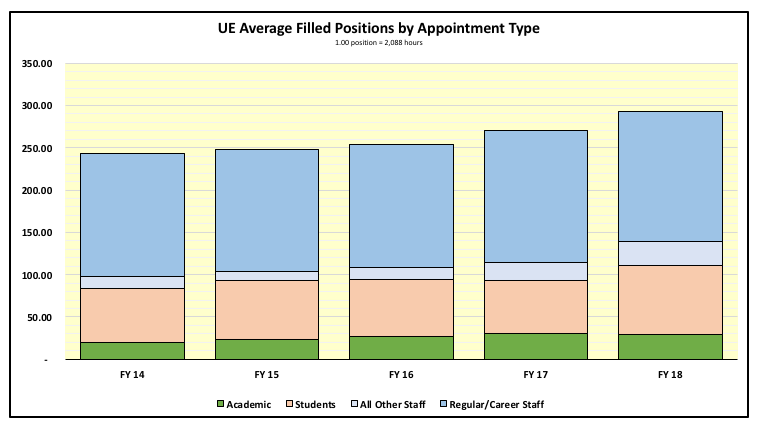 From FY14 to FY 18, the total number of filled positions increased by over 50.51 positions, from 242.73 to 293.24, with the number of career staff positions increasing by close to 7% and student employees up by over 28%. With career staff positions comprising the largest percent of the filled positions, I also track the turnover of these positions. 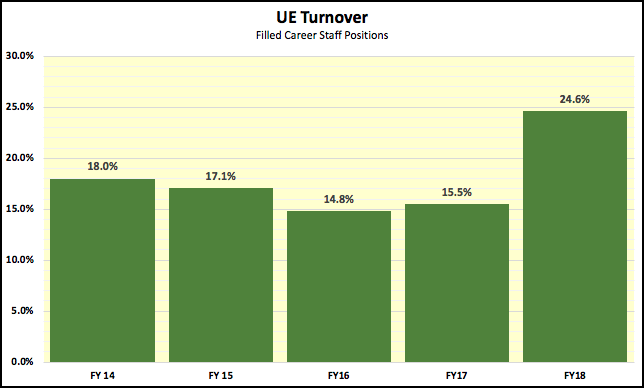 The UE Turnover chart shows the percent of career staff that have departed the divisions over the past five year. From FY14 to FY17, the turnover was relatively steady, moving between 14.8% to 18%. That was, until FY18, when the turnover of career staff positions increased to 24.6%. This increase is alarming on a number of levels. Career staff provide the continuity of services, hold deep knowledge about campus processes, and serve as the backbone for unit operations. These are important positions and the departure of seasoned staff have a huge impact on the ability of units to deliver services. Since there is not information available for other divisions on turnover, we are unable to compare our numbers across the campus to determine if the turnover is widespread or a problem for our division. Given that the economy is hot, unemployment is low, and the cost of living in Santa Cruz is extremely high, we know these factors are related to the turnover. However, we are hearing anecdotally that other issues are at play. Issues that involve workload, inefficient and burdensome processes, and the need for more professional development opportunities. Hmmm...it seems like I need another chart. A chart that gets even deeper into this turnover issue. That’s where each and every one of you come in. I need your help. I would like to hear from you about ways we can address the turnover issue. Send me your thoughts. Tell me about your experiences and what you are hearing. Why are people leaving? Why are people staying? What else can we do to improve operations? As has been reflected in the charts, we have been investing significantly in positions and people across the division. Until FY18, I thought those investments were making a difference. I really want to know so we can make adjustments. There you have it. What do I do? I make charts. I also care deeply about the operations of Undergraduate Education. I’d love to hear from you. My email is tcodding@ucsc.edu or call me at 9-1706. You can also submit suggestions anonymously using our online feedback form.